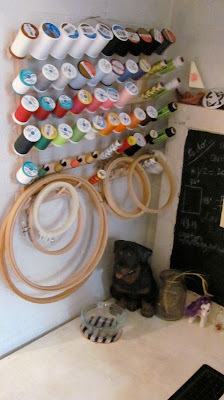 This past month at the Craft Magazine Blog they have been showcasing different artist's work spaces. This is something I have always been interested in. I love to see where people work and create and see all the little bobbles and trinkets that they have around them to inspire them. For my inspiration, I have a poster from my favorite letterpress company Yee-Haw Industries that says "Keep on the sunny side." I also have notes from my grandmother and mother just to have their handwriting and little notes lying around. Also many little things like drawings, presents and pictures people have made me. On the side of the desk is all of my billboard vinyl that I use to make my recycled billboard bags. The background on my desk is an old window I found in the trash outside of my house. 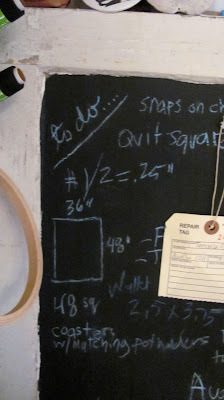 I painted one pane of it with chalkboard paint and I use that to write down measurements or projects I'm working on. Its proven to be a very good thing for me since I lose my notebooks all the time. 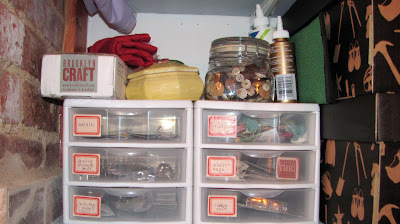 We live in a ground floor apartment in Brooklyn, so I'm not lucky enough to have a dedicated crafting room. For 2 years I just had a pile of my stuff in the corner and would take over the kitchen table whenever I was working on something. Needless to say this did NOT work out for my boyfriend and I. It was a mess. 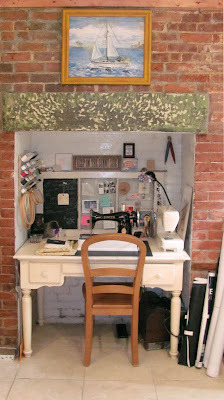 So eventually I decided to make use of the fireplace in our kitchen and turn it into my sewing desk. 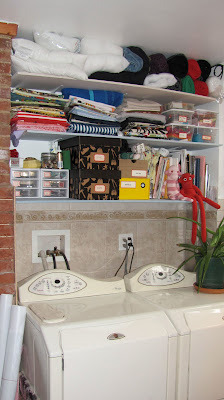 I eventually built shelves above the washer and dryer (I know, they are unheard of in Brooklyn!) and made sure I organized it all so it made sense. All of us in the apartment are a lot happier and I am more organized. I am so jealous of your creative space! You have to come make me one out of my closet! I love all the organization tricks. I swoon. where's the "sew to victory" poster? roxanne! its on my desk!!! on the right! now THAT is creative! well done!